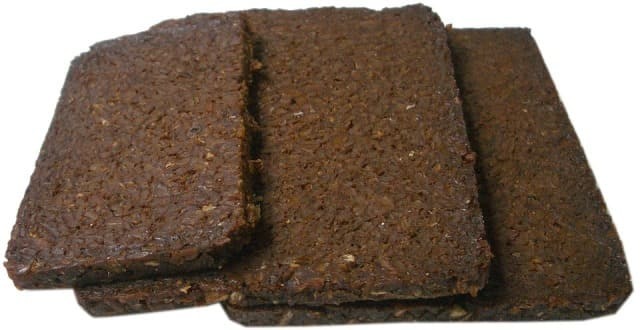 Pumpernickel bread is a good darker and thicker bread with higher levels of protein, fiber, and antioxidants than the average white bread. As you can see from the ingredient list, this recipe is a lot different than your average homemade wheat bread or light bread, kind of like a Guinness versus a Budweiser in terms of look, taste, thickness, and nutritional value. Enjoy this hearty healthy homemade pumpernickel bread recipe on a frugal budget! Place all ingredients into bread maker machine using whole wheat bread dough setting. Remove the dough from machine, shape the loaf and place into lightly grease bread pan with lid. Let rise for 1 hour. Bake at 350 degrees for 35-40 minutes for a 1 pound loaf. Remove from pan and cool. Store the bread in a tightly sealed container. Enjoy this hearty homemade frugal feast! I hope you enjoyed this free recipe for hearty healthy homemade pumpernickel bread on a frugal budget.